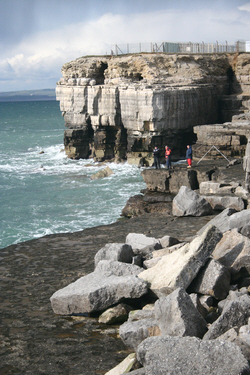 Portland is a part of Dorset like no other - it’s wild, it’s harsh and it’s wonderful. For a start, Portland is an island linked to the mainland only by the causeway at Ferry Bridge and the Chesil Beach. Technically, these two links probably mean that the “Isle of Portland” is more properly a peninsular. Even so all the maps call it the “Isle of Portland” and locals often just call it the Island. Either way, this massive lump of rock is the remains of the most southerly ridge of a series running across Dorset. This plate of Jurassic limestone is tilted from North to South, so that the elevated North of the “Island” has great views across the Chesil, Portland Harbour and Weymouth. Meanwhile the southern-most tip dips into the English Channel where the waves break over “Portland Bill”. Portland is famous for many things, not least the stone from which it is made. The Island has a proud history in quarrying and stonemasonry, the results of which are obvious on the Island itself with quarrying activity clearly visible through numerous massive holes in the ground. One of which,Tout Quarry, is now open to the public and has its own display of outdoor sculptures. Portland’s stone is also proudly displayed in other places too, not least our capital city, where Portland stone has been used for many prominent buildings and monuments, including Buckingham Palace and St Paul’s Cathedral. Islands seem to attract penal institutions and Portland’s no different. It once had three! It became well-known in the media for the prison ship HMP Weir, which was moored in Portland Harbour, but is also home to a Young Offenders Institution (YOI) and the Verne. The latter was converted to a prison having been built as part of the same defence network against the French of which Weymouth’s Nothe Forte is part. A much earlier, Tudor defence against the French can also be found at Portland Castle. Both the YOI and the Verne are fairly austere and, arguably, appropriately menacing looking buildings to the North of the Island, with the Verne looking out protectively, as you might expect of a former naval battery, over the harbour below.. If you want to see it for yourself, you can go there and enjoy some excellent barista coffee and a bite to eat at the “Jail House Café”. This thought provoking eatery inside the walls of the Verne is run by inmates under licence, but is open to the public. It’s great value for money and the view over Weymouth Bay and Portland Harbour is truly special. Portland Harbour was once one of Britain’s most important Naval bases and, like the nearby but much smaller port of Weymouth, played a large and important role in the D-day landings of 1944. Many of the young men who fought and lost their lives on the beaches of Normandy, particularly Omaha where thousands died, embarked on their voyage across the Channel from here. Portland Harbour has now been all but deserted by the Royal Navy, but is again booming with civil uses and new industries. It is also the home of the National Sailing Academy which played such an important part in Weymouth & Portland’s hosting of Olympic sailing activities in 2012. 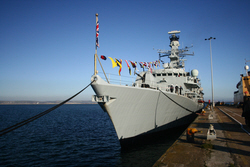 The Harbour was also home to HMS Osprey, a naval helicopter air station. Whilst this has also gone, parts of the former air base are now home to the area’s famous air-sea rescue helicopter. This distinctive red and white helicopter can often be seen skimming along the coast or heading inland to the local hospital and is a welcome, cherished and highly-valued part of the local emergency services on sea and land for tourists and locals alike. So that’s Portland then, an island community with its roots in the primary industry of quarrying, prisons and seafaring. Except, that’s not it. Portland is also, in its own rugged and wild way, exquisitely beautiful. And nowhere more so than the area around Portland Bill. “The Bill” is a magnificent place and a complete contrast and surprise compared to most of the rest of Dorset. While much of the County is smooth and green and rolling, Portland Bill is predominantly rough, grey and jagged - and it’s fantastic! 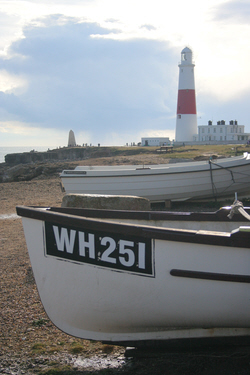 Portland Bill is a naturally beautiful place in the way that only big waves on big rocks can be. There’s little between the Bill and the Atlantic Ocean, giving the area an air akin to the West Coast of Ireland or the rugged coasts of Cornwall or Scotland. With its historic and current links to quarrying the comparison with Cornwall is apt as the villages on the Island and around the Bill consist of small, sturdily built cottages and terraces, many made from huge blocks hewn from the rocks around them. And then there’s the sea. 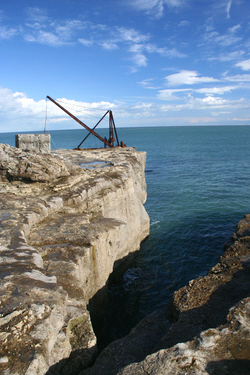 Looking out from Portland Bill, its easy to see why this was, and is, an important place to stick a lighthouse. In fact, there are three. Two have now been turned over to other uses but the newest is still active and a great visitor attraction - if you don’t mind heights and steep steps! Even if you decide not to go up the lighthouse, there’s plenty to see for free from Portland’s craggy rocks. 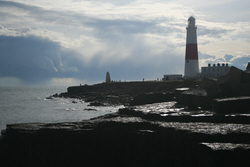 The views out over the tidal race and into the Channel are great, as are the views along Portland’s east and west coasts, both of which can be walked via a network of footpaths that circumnavigate as well as crisscross the Island. If rambling’s not your thing, then stay in the area around the Bill, soak up the views and enjoy the fresh sea air. Even on the most busy day, you’ll be able to find a place to sit on a rock and peer out to sea and get a real sense of watery wilderness. Or, take yourself off to the Lobster Pot café, which is metres from the cliff-top and enjoy a lunch or a cup of tea. There’s a sizeable car park at the Bill, but it is also served by local buses. Portland Bill’s semi-natural, semi-industrial-wasteland style of beauty is as wonderful when the weather is grey and stormy and the seas are white with foaming breakers as it is under blue skies and calm seas. It’s also an interesting place to visit at night, to watch the huge light-beam scanning the horizon. But take a torch for nocturnal visits unless you want to end up tripping over the rock strewn landscape and falling over the edge! The only conditions in which you might not want to visit this wonderfully atmospheric place is in fog. This is something Portland suffers from quite a lot because of its location. It makes the area treacherous to those who don’t know it and the fog horn is necessarily very loud! Portland isn’t a place people always think of visiting as part of their Dorset holiday. Frankly, if they don’t, they are missing out! Some go there to fish, some to walk and some for the rock climbing, but Portland is just as good as a place to visit, to admire and to relax. That’s probably why the clustered community of sheds and beach huts, which add to the unique feel of this oddly wild and untamed place, are so sought after! You wouldn’t say Portland was pretty, but its beauty is beyond dispute. A final top tip. Don’t mention rabbits. Local tradition says they are very bad luck. Something to do with quarry workings being made unstable and dangerous...You have been warned! You wouldn’t say Portland was pretty, but its beauty is beyond dispute..​"